Samajwadi Party Website | Check Latest Update | Mulayam Singh Shivpal Yadav & Akhilesh Yadav news in Hindi | Website name Pragatisheel Samajwadi Party News. 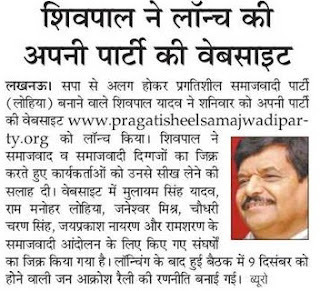 Samajwadi Party Latest News Samajwadi Party Leader Shivpal Yadav has Launched its new website under his banner named www.pragatisheelamajwadiparty.org. Followers of Samajwadi Party must visit this website and become members as your wish. For Your kind information Shivpal Yadav previous was the members of Samajwadi Party leaded by Mulayam Singh Yadav, Akhilesh Yadav and its other famous personality who joins SP party. After Removing himself from Samajwadi Party who is founded by Mulayam Singh Yadav (1991). Shival Yadav formed new party called Samajwadi Secular Party. The Main object Secular party is to grab vote on secular basis. 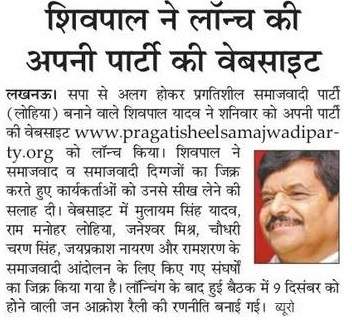 Pragatisheel Samajwadi Party News in Hindi: 25 November After LAUNCHING NEW Website by Shivpal Yadav, he advice its party workers and leader to learn the moral duty, realize some important work done by Ram Manohar Lohia, Mahatma Gandhi, Janeshwar Mishra, Chaudhary Charan Singh, Jai Prakash Narayan and Ram Sharan. He also mention hardwork of Samajwadi Andolan. Samajwadi Rally Date: Launching new website he make Samajwadi Party new rally date on 9 December 2018. Founded by: Mulayam Singh Yadav. Founded by: Shivpal Singh Yadav. Target: Lok Sabha Election, Vidhan Sabha Election, MLS, Gram Panchayat.